Scary 3D bats all over the wall / window. Arrange them as you wish. You definitely want them in your Halloween Party. Comes with easy to apply style. Material: waterproof pvc. Color: black. Leave no residue or damage when peel off from wall / window. Bats packed flat. DIY them into different wing angles. Easy to stick. Fit any SMOOTH & DRY surface like painted wall\glass\tile (REMEMBER to CLEAN the dust before applying). 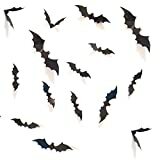 Each pack totally includes 28pcs pvc material bats, 30cm x 7.5cm/each x 8 big bats , 20cm x 5cm/each x 8 medium bats and 12cm x 3cm/each x 8 small bats and 8cm x 2cm/each x 4 small bats.